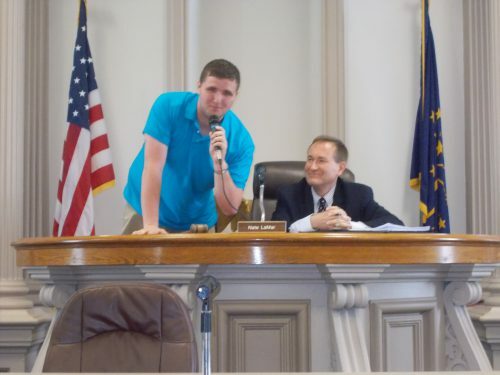 As April is National County Government Day, Nate always invites Honors Government students from area high schools to shadow each County Council member and allows students to engage in parliamentary procedure. As a servant leader, Nate was elected County Council President half-way through freshman term and at the height of recession, Nate has made economic development the Council’s focus. Throughout his career, in both the public and private sectors, Nate has earned the respect of superiors and subordinates alike. From 2011-2012, Nate was President of the Eastern Indiana Development District (EIDD), on whose board he had served since 2007. From 2016-2017, Nate served as a board member of the East-Central Indiana Regional Planning District (ECIRPD). With disciplined stewardship, Nate led Henry County through lean years safeguarding taxpayer dollars, such as initiating joint purchasing for greater buying power for government entities. On Nate’s watch Henry County’s credit rating was raised to an A, and then A Stable, which allowed for refinancing county bonds at lower interest rates, and also eased Ivy Tech’s construction. A firm believer in transparency, Nate opened the process by advertising County Council’s citizen appointments to boards and commissions, and has encouraged other government entities to do likewise. Following a 15 year dormancy, Nate reconstituted the full 10-member Job Classification & Salary Advisory Committee, in order to make personnel decisions more objectively. A frequent advocate for Eastern Indiana’s regional planning and economic development organizations, Nate has made non-taxpayer funded trips to Washington, DC, often on his own, to meet with our US Senators and US House members. He also often meets with state legislators on behalf of our area. A firm believer in continuing education, Nate is active in the Association of Indiana Counties (AIC).